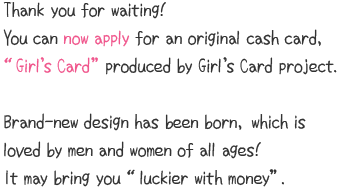 ・You can apply for the Girl's card via the internet (including smartphones), at Seven Bank manned outlets or at our Customer Center. ・When changing (reissuing) from an existing Seven Bank account cash card (not a Girl's card) to a Girl's card, there is a reissuance fee of 1,080 Yen (including consumption tax) debited from your account when the Girl's card is issued. Please contact the Customer Center for more information. ・After using a new card that is reissued, the existing cash card can no longer be used. We apologize for any inconvenience this may cause. 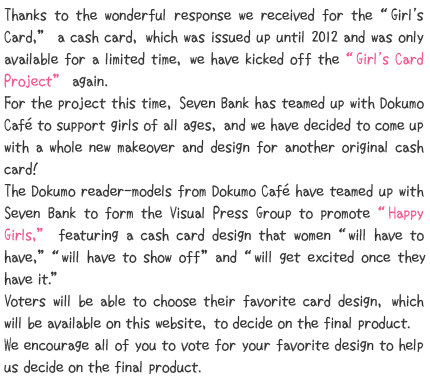 ・Be aware that when reissuing a Girl's card, a cash card with a different design may be issued if the Girl's card has been discontinued, or due to another reason. Copyright© Seven Bank,Ltd. All Rights Reserved.